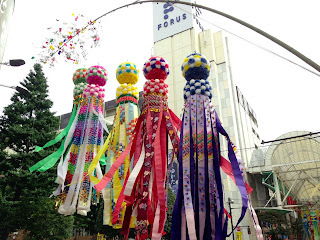 This past week my wife and I traveled to her hometown, Sendai, to spend time with family and to give me my first chance to enjoy the famous Sendai Tanabata Festival (仙台七夕まつり "Sendai Tanabata Matsuri") together with them. 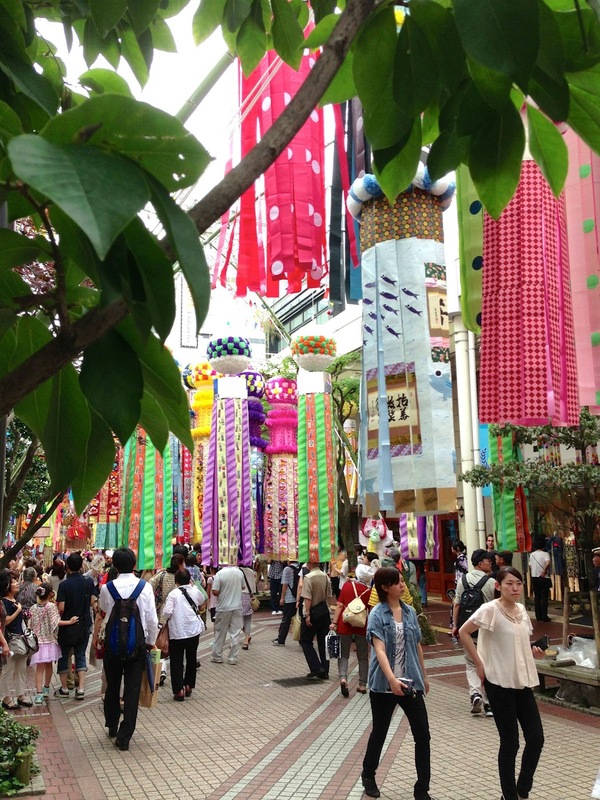 The festival of Tanabata is celebrated throughout Japan at slightly different times, most commonly on July 7th (7/7), but not everywhere. 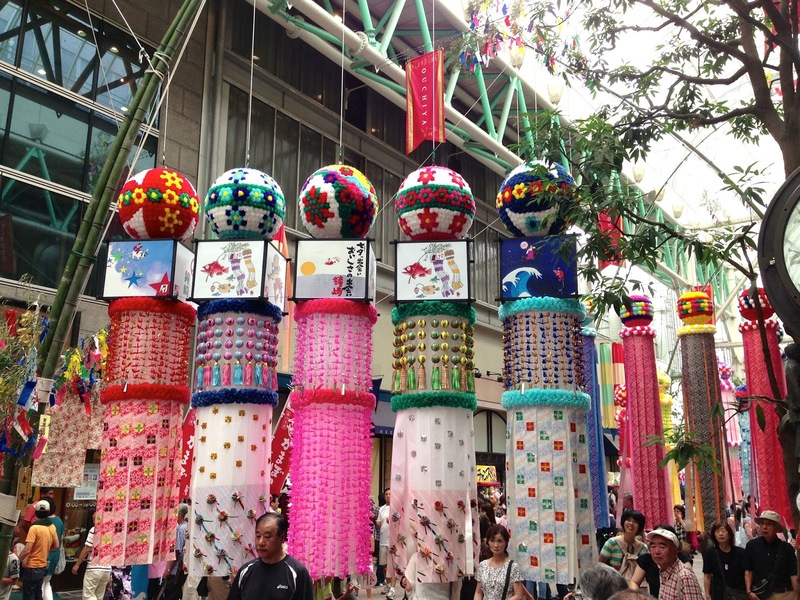 The festival in Sendai is particularly famous and known by people all over the world. 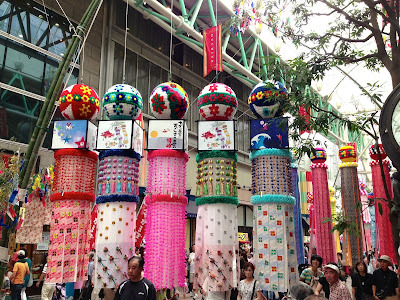 In Sendai the celebration happens in early August, which is more closely aligned with the original date of the festival (since many centuries ago it was scheduled on the lunar calendar). 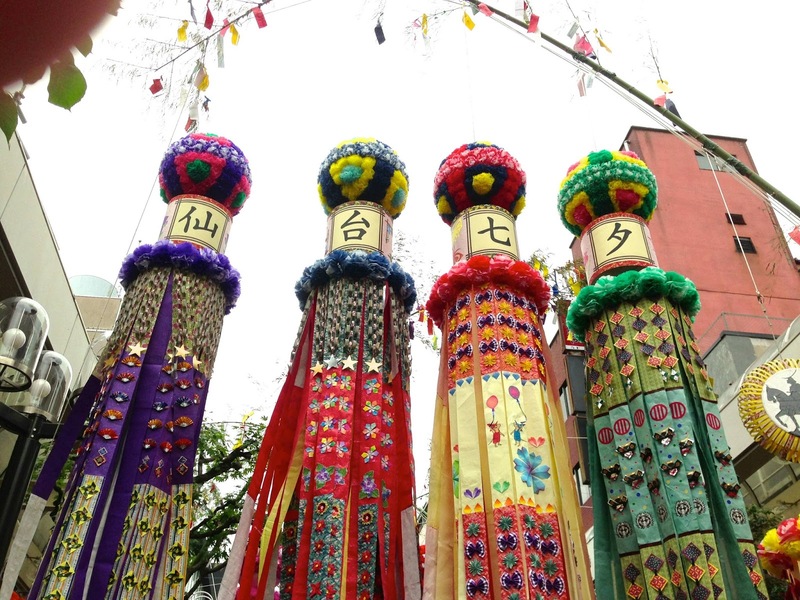 Tanabata is a Star festival dating back to the mid 700s and was originally inspired by the annual "Qixi" star festival in China which is even older. 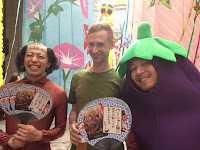 While I've never heard of a festival in Japan that I find uninteresting, the history of this joyous festival is particularly charming and in some ways heartbreaking. It started back in ancient times when the goddess Orihime (織姫), or "Weaver Princess" would weave beautiful textiles while sitting on the banks of the "Milky Way" River. Her father Tentei (天帝), the Sky Emperor (a.k.a. the Universe), thought they were the most beautiful textiles in all of creation and cherished them greatly, so the princess kept very busy, diligently weaving her fine fabrics for him. In her devotion to her work, Orihime became lonely for companionship and became saddened by the idea that she may never fall in love. Although by virtue a very strict god, fatherly compassion for his daughter led Tentei to the idea that he could perhaps introduce his daughter to someone, so he did. When Orihime met Hikoboshi (彦星) the Cow Herding god, the two fell in love at first sight and were married soon after. The two were so in love that they neglected their work to spend time together. Orihime spent no time on her weaving, and Hikoboshi's herd of cattle ended up wandering all over the universe. Seeing this, Tentei became furious and brought down divine punishment upon them, separating the two forever and allowing them to never meet again. So great were Orihime's tears and deep sadness, that Tentei could not go on without extending to his daughter at least a tiny token of kindness. He promised her that so long as she worked hard on her weaving, she could be allowed to reunite with her husband on 7th day of the 7th month. Even now, in modern times, this heavenly cycle continues the same as it has through the centuries, and on the 7th day of the 7th month each year, Orihime and Hikoboshi are allowed to be together all day. So joyous is the occasion that all of us humans celebrate along with them and share in their happiness. Tanzaku (短冊) which are strips of paper upon which you write a wish in hopes of getting some divine assistance. 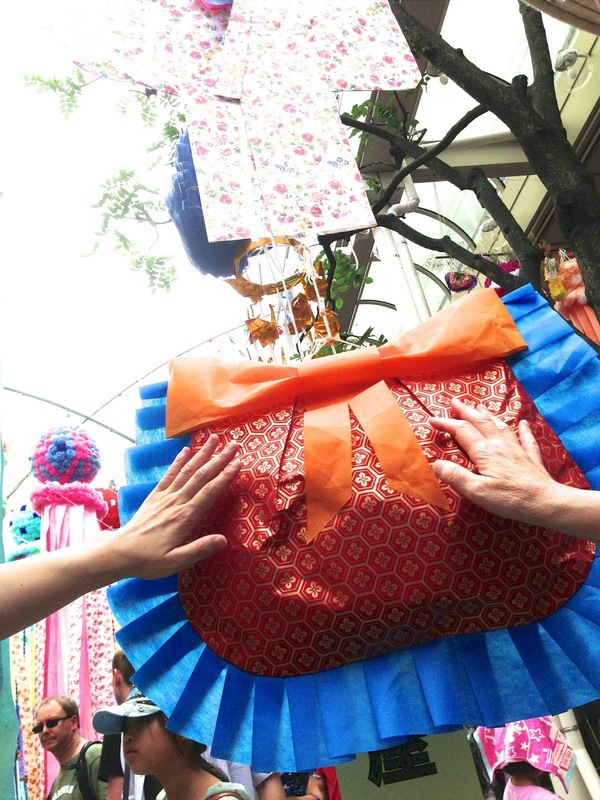 Kinchaku (巾着) which is a paper purse and in its symbolism will help to encourage prosperity in business. Toami (投網) are nets which bring a bountiful catch and harvest to fishermen and farmers. Kamigoromo (紙衣), or paper kimono. Symbolic of Orihime's weaving, they help to ward off poor health and help to inspire craftsmanship. 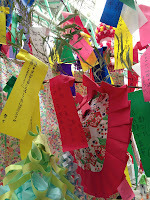 Orizuru (折り鶴), or origami cranes, which help to bring good health and long life. The start of the festival is marked by a fireworks display and a parade, and then continues for three days. The way to celebrate Tanabata festival is to get together with your family and/or friends and head into the main downtown shopping district in Sendai where the festivities take place. 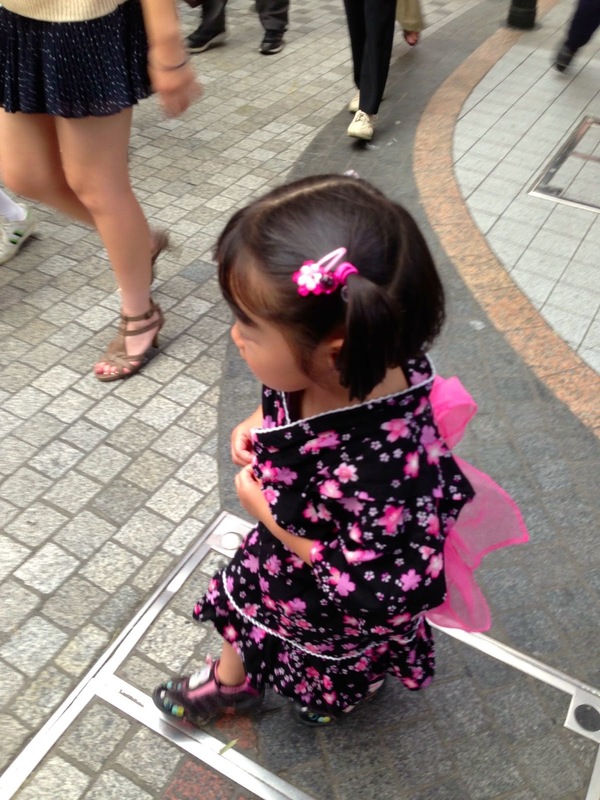 The thing to do is stroll the streets at your own pace, taking in all the scenery and festive atmosphere. 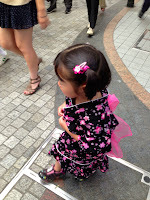 The streets are lined with food, drink and souvenir vendors, as well as traditional festival games. Girls and young ladies are often dressed in colorful yukata (traditional Japanese summer-weight clothing), and some people occasionally find their own original ways to celebrate as well, for example with a crazy costume. 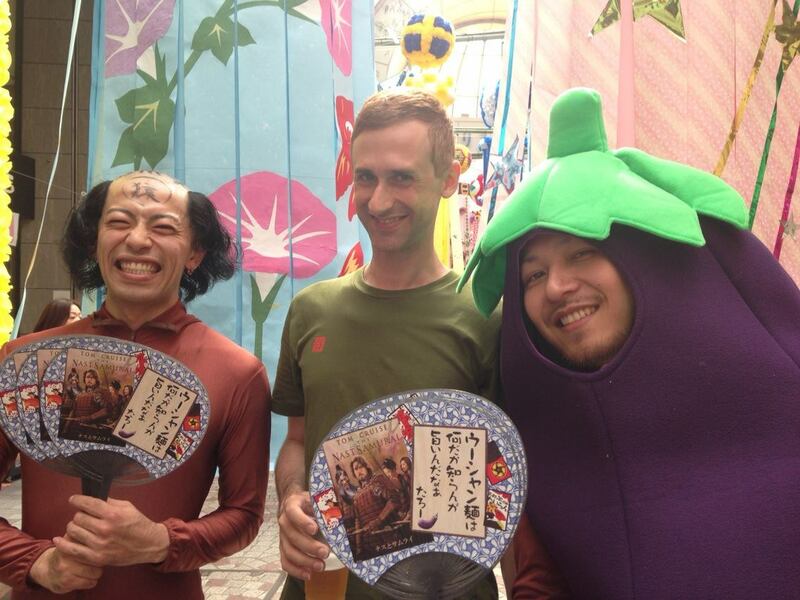 茄と侍 or "Eggplant and Samurai." LOL!